When I posted this question several weeks ago, I never anticipated it would touch a nerve. Now I'm receiving comments here, here, here and (of course) right here. Not surprisingly, the responses span the spectrum. One commenter noted, "That philanthropy is harmful to Africa should by now be a given for anyone who’s heard the Hippos vs Cheetahs pitch from George Ayittey," referring to Ayittey's entertaining (and convicting) TED Talk. "First of all, I think the issue of saving lives has to be addressed first, and trying to make life bearable for those who have the least in this life, and how can you sit around and debate this issue, when the human toll is so great? It must be along with the efforts of the government of the host countries to improve the plight of their country that NGOs will be able to step aside and consider entrepreneurial initiatives as more important." So one suggests that the idea of philanthropy killing Africa is obvious, and another asks "what are the alternatives?" Both comments note a common theme: the impact of corrupt, dishonest or wasteful African governments. I've stated before that I'm no African expert, but it doesn't take an expert to realize there are significant problems with the way U.S. and Western aid gets spent in developing countries. And it only takes one story of planeloads of dollars being flown out of a developing country for unknown destinations (most probably Swiss bank accounts) to bolster the idea that aid is wasteful. But let's take a slightly deeper look at the issue (just because I hate to settle for simple answers), relying on the place in Africa I know best -- Ethiopia. For starters, I'd like to acknowledge the important question that is often overlooked regarding Western aid to developing countries: "Does it make sense to require a minimum standard of behavior governmentally and economically regarding principles of freedom, democracy, and a marketplace concept of private ownership and the "rule of law?" Put another way, should the United States and other democratic countries of the Western world provide assistance to countries run by repressive regimes? As you might guess, this isn't the first time someone has asked this question, so I won't try to reinvent the wheel. The concerns of both sides, as they relate to Ethiopia, are well elaborated in the back and forth between Helen Epstein and Ken Ohashi in pieces published in the New York Review of Books this past spring. The only thing I would add to their dialogue - and the thing that often goes missing from these discussions - is the question of "how do we define 'good' and 'right' when we are making moral decisions between 'good' and 'bad' and 'right' and 'wrong.' Both Ms. Epstein and Mr. Ohashi have implied assumptions about what is 'good' and what is 'bad,' and what is 'right' and what is 'wrong,' without ever putting those assumptions to the test of stating them and letting others critique. Ms. Epstein clearly would posit that aid to a repressive regime is bad or wrong. Why, is not difficult to infer - if the regime is repressive, stifling individual freedom and creativity, then providing it assistance condones the repression. But what if people are dying and lives could be saved by providing aid? Then, the humanitarian issue faces both ways and difficult decisions need to be made. Mr. Ohashi would posit, on the other hand, that aid should be divorced from the political issue, because over time, the will of people to be creative, independent and free, will overcome political repression, particularly if they can live healthy and strong lives. But what if strong, healthy people are being jailed and killed for no reason other than their political opposition? And how do we decide what to do in these circumstances? Perhaps the answer is our government aid, and how it is administered. Is US Aid a Good Thing? Both Ms. Epstein and Mr. Ohashi imply that aid is good and right (at least under certain circumstances). That's the assumption I'd like to consider more carefully. 1. When we talk about foreign aid, we need to make distinctions. Much of our aid to the developing world is designed to help address dire crises. Thus, for example, due largely to the significant and important U.S. funding to fight HIV/AIDS in Africa, health program areas received 59% of USAID/State-managed assistance for Africa in 2008 and received 67% under the 2010 budget. But attending to the crises by providing funding for basic needs, such as health, food assistance in times of drought, and water and sanitation, is hardly a sustainable model for development, particularly if the goal is to help people "learn to fish." And perhaps more importantly, people are still open to gross exploitation if they only have their basic needs met, but have no hope of educational opportunity and economic opportunity. Put another way, if we want to pursue a goal of helping people help themselves in the developing world, then we need to consider both how to provide for their basic needs, and how to give them the hope of economic and educational opportunity. 2. In most of the developing world, the economic opportunity that is most likely to impact the "poorest of the poor" positively, is agricultural development assistance. In Ethiopia, for example, a country of 80 million people, nearly 60 million people live and die based upon their own agricultural efforts in the rural lands away from the country's cities. For the most part, these rural famers have no wells or even water supplies, other than what their wives and daughters can carry on their backs. Without water supplies, they have no interest in drip irrigation and other means of watering their crops, other than the seasonal rains. Thus, they are more dependant on Mother Nature than you or I could possibily imagine. During 2005-2008, U.S. agricultural development assistance for sub-Saharan Africa grew significantly, from an estimated $657 million in 2005 to $1.1 billion in 2008, when all bilateral and multilateral channels are considered. These increases are significant and important. However, even with projected increases in 2009 and 2010, U.S. agriculture funding for Africa remains a relatively small fraction of U.S. assistance globally and within Africa, and continues to lag far behind health funding. In 2008, agriculture programming for Africa was 0.8% of global U.S. foreign assistance and 3% of the U.S. assistance for Africa managed by USAID and the State Department. Even with significant increases in 2010, agriculture programming for Africa is just 1.8% of global U.S. overseas development assistance and less than 10% of assistance for Africa. Thus, we are spending only a small fraction of our aid on programs that would appear to directly impact economic opportunity for the majority of people. 3. How does our agricultural assistance occur? Much can be discerned simply by understanding the appropriations mechanism. For example, the $2.5 billion in annual food assistance authorized most recently by Congress, occurred in the 2008 farm bill. And although the new farm bill adds promotion of food security and support of sound environmental practices to the objectives of commodity donations, the basic impetus of this aid is use of US agricultural production, NOT assisting other countries with their own agricultural production. That's why the basic program is called "commodity donation." In fact, it has been estimated by some researchers that nearly 85% of the USAID budget in this area is earmarked for specific expenditures, primarily food expenditures from US producers. So, we spend additional sums on food assistance, but it is a small fraction of what we spend in international aid, and mostly it seems to be earmarked to help US agriculture companies. So someone needs to ask the question, are we really helping Africa help itself, or are we helping ourselves, at the expense of African farmers? * Information in this section of my post has been gathered from multiple sources, including testimony before Congress by folks such as Julie Howard, Executive Director of Partnership to Cut Hunger and Poverty in Africa. One concept that is not very well known and I believe is instead very powerful for fighting poverty is the Basic Income concept. It has been implemented with success, recently in Namibia - and Alaska has a similar program currently. A recent publication on this theme is http://www.kpbooks.com/Books/BookDetail.aspx?productID=234740. The implementation of a Basic Income program can be encouraged by Western countries as one of the condition for investment. What do you think are meaningful ways that private citizens can help the developing world? I'm investigating Fair Trade as a way to help. 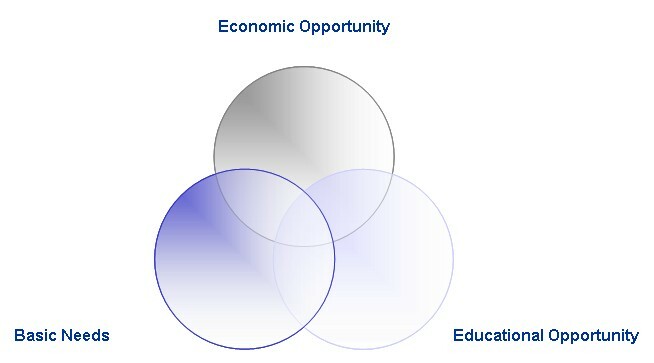 Have you found other organizations or individuals that are engaged in meaningful/helpful economic development? I'm particularly interested in initiatives that capitalize on innovations from Africans.